Famed scientist, Stephen Wolfram, announced "phase two" of his online "computational knowledge engine": Wolfram Alpha Pro. The enhanced service features new ways to input data, understands even more data formats -- about 60 to be precise -- and allows users interact with and manipulate computed output. The upgrades come at a price though -- $2.99 per month for students and $4.99 for everyone else. Users can now simply drag 'n drop data sets into Wolfram Alpha Pro. "You take the data, throw it at Wolfram Alpha Pro, and see what it has to say about it," Dr. Wolfram stated. 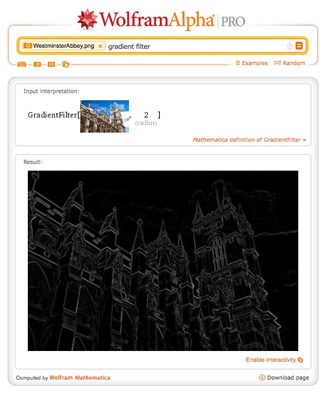 One such example was dragging a 3D guitar model into it, which allowed Wolfram Alpha Pro to respond by rendering the object and generating a report which included the number of polygons shown. The coolest thing here though, is Wolfram Alpha Pro knew what kind of data it was dealing with, figured out how to parse it and then made good guesses about how to display the results. Other interesting analyses can also be had by submitting images, spreadsheets, writings and other types of data. In fact, uploading a photo to the website produced the image line detection results seen on the upper right. More examples can be found here. Stephen Wolfram's philosophical approach of "put something in and see what comes out" sounds very much like what we heard in 2009, when the project first debuted. However, one can sense the improvements bring it closer to his original vision. "That really surprised me. I was not expecting that. I just didn’t realize that was that that kind of quantitative-ness in that area [names]. But that’s just one tiny example. I mean I‘m continually surprised," Wolfram went on to explain, "I’m sure at some level the data exists, because after all we’re getting it from somewhere. But the issue is to what extent can we get – when you actually see it presented in kind of a clear graphical or whatever way, I’m often really struck by sort of – you see a lot of things that you just would have never noticed any other way." Currently, Wolfram Alpha Pro is being limited to data sets that only take seconds rather than minutes to process. Wolfram says this should change in the future as the hardware used to crunch all of this data is upgraded to handle such queries. The need for faster hardware was also purportedly a key factor in deciding to charge for the new features. Dr. Wolfram, of Mathematica fame, has had a very successful career as part scientist, part software engineer and part entrepreneur. At age 15, he wrote his first physics thesis and at age 20, received his Ph.D. at Caltech in particle physics. Just a year later, he won the prestigious "Genius Grant", the colloquial name for the MacArthur Fellowship award. Between sales of Mathematica, the software which powers Wolfram Alpha, and the website's mobile app, the enterprising scientist claims his computational knowledge engine has become profitable. The recent spike in traffic from Apple's Siri probably hasn't hurt either. Siri now accounts for 25% of Wolfram Alpha's visitors.